Buddy Guy Celebrates Fifty Years Playin' Blues! What can you say about Buddy Guy? The 70 year old blues legend has been performing for 5 decades! The San Francisco Chronicle's online news service features a cool article about Buddy. I'll never forget reading a 90's Buddy Guy cover issue of Guitar Player Magazine. The interview struck me so hard that I found myself crying. I wasn't affected by all the obvious stuff, like how he payed his dues and was pulled off the streets by Muddy Waters, who gave him sandwiches and got Buddy started. No. What really hit me was his humility. Buddy Guy is the most humble person I know. Allan Holdsworth is like that as well. When artists of their stature are so self effacing, it's just beyond holy. Buddy Guy was also on the August 2001 GP cover. Anyone recall the earlier issue I'm talking about? 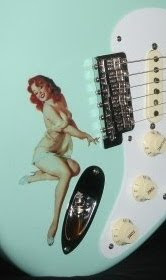 Visit www.buddyguy.net a very groovy website with Buddy's tunes blastin' on the home page.